Do you have enough time in the day to read everything you want? With many students getting ready to enter college or university, I thought this would be a good place to start. 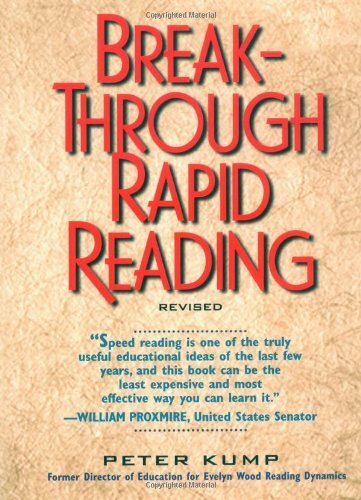 I am currently working on a self study program, "Break Through Rapid Reading" by Peter Kump. This is something I wished I did years ago when I was still in school. My reading speed was pretty good before but as I have started working on this program, it has jumped leaps and bounds not only in speed but also comprehesion. And for less then $12 a super deal. So if you have alot of books/materials to get through this would be a worthwhile program to do. How much time would you save if you could read even just 50% faster? What if you could double your reading speed? So give it a go and let me know what you think.